The Latin Baby Book Club's February selection is ARROZ CON LECHE: Popular Songs and Rhymes from Latin America by Lulu Delacre. Delacre’s book is one of the first of its kind to have found its way into publication. 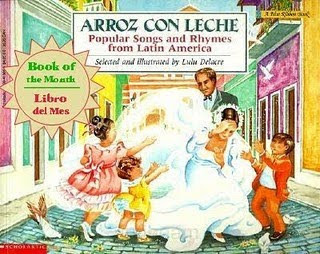 It was published in 1989 by Scholastic, the largest publisher and distributor of Spanish-language books in the U. S. Not many Latinos grow up without learning the popular children’s song, Arroz con Leche. But when Delacre went in search of a book that taught about it and other Latino folksongs for her own children, she was disappointed. Seeing the need, she began selectin the most popular songs from Latin for a book. She partnered with Elena Paz, who wrote the English lyrics, and Ana-María Rosado, who created the musical arrangements. The end result is a valuable collection of traditional nursery rhymes and finger plays told throughout the Latin America. She credits the countries of Puerto Rico, Mexico and Argentina for the songs’ origins.